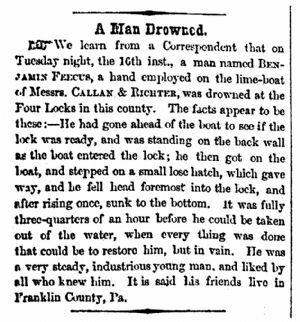 He had gone ahead of the Boat to see if the lock was ready, and was standing on the back wall as the boat entered the lock; he then got on the boat, and stepped on a small lose hatch, which gave way, and he fell head foremost into the lock, and after rising once, sunk to the bottom, it was fully three-quarters of an hour before he could be taken out of the water, when every thing was done that could be to restore him, but in vain. He was a very steady, industrious young man and liked by all who knew him. It is said his friends live in Franklin County, Pa.